For this reason a man will leave his father and his mother, and will be joined to his wife. And they will become one flesh. Adam who has been split into male and female now seeks to reunite and recreate the unity that existed before that reflects the unity of our God who is also One. Now this all sounds great until you flip it around. The corollary of “male and female together make up the full image of God” is that individually a man or a woman do not reflect the full image of God*. People don’t like that. People don’t like being told that they need someone else. It’s the sin of pride and of rebellion that goes against popular culture “you can do it all” attitude. However, unlike Jesus who is the exact image of the Father (Heb 1:3; Col 1:15) God in His wisdom did not create male and female the same. Otherwise we wouldn’t have blind spots and we wouldn’t need the other. We would already be complete†. The Hebrew words used for their creation testify to this difference. The man was יָצַר (yatsar) moulded/squeezed from the earth like a potter does to clay, whereas the woman was בָּנָה (banah) built/fashioned from the side of Adam. It is also interesting to note that the development of a baby mimics the split of Adam into male and female when at 7 weeks boys experience a testosterone surge which literally destroys the corpus callosum that joins the two hemispheres of the brain. The male baby is cut off from part of himself. The saying opposites attract actually has a lot of truth to it. However, without unity in Christ opposites may attract but they can also destroy each other. My early marriage is an example of this. You see I was attracted to my wife because she was so different to me. I’m actually quite introverted whereas she is such a people person. I like everything predictable whereas she likes surprises. Yet I am fine with mess but she loves the house looking ordered. I am a hoarder whereas she is a thrower. I’m a sorter, she’s a tidier. I like going to the same places again and again whereas she likes going to different places each time. You get the picture. However, when we got married I assumed that my way was the “right” way and tried to make her like me and said her way was wrong. I crushed the spirit out of who she was. She too assumed that her way was the “normal” way and so didn’t understand why I didn’t see the things that she did. Why didn’t I see the mess, why didn’t I wrap up presents, why did we always do the same things, buy the same food and not go to parties? She became frustrated with me. We both became unhappy as we both wanted the other to be like us and neither of us were. And my domineering ways meant the she capitulated and did things my way but actually this didn’t please me as my life became dull and monochrome. This is no surprise as we were no longer reflecting the full image of God – the plurality in unity – we were no longer bringing Him glory. Even our children became partakers in this battle. If one of them said “I like doing… with you daddy” I would take it as confirmation that I was the better parent. If one of them said “Mummy lets us …” I would take it as an offence. Fast forward some 15+ years and we are in a different place. We came to the brink of divorce but a marriage course, the transforming work of the Spirit through courses such Celebrate Recovery and Freedom in Christ, together with sozo and other prayer sessions and just the ongoing maturity through the Spirit’s work means that we are unashamedly who we were created to be. We recognise that we are different. But we realise that our differences are a gift to the other and we need to honour that gift or we will become diminished as a result. We each have blind spots and the other is God’s gift to to show us what they are. Here’s a silly example that illustrates this. I always used to berate my wife that she never checked the oil or the tyre pressures. This was something that I felt I “had” to do because she never did. But the reality is that God has made me different – so that I see this but she doesn’t. Therefore my gift to our marriage is to check the oil and the tyre pressures. She blesses me if she honours that difference “Thank you for checking them – it means a lot to me” (or whatever love language works for you). I don’t need to resent that she never does this – because her gift to me is something different. An example is that she always remembers to get birthday cards for friends and family. This is something I never did before I was married. So I honour this difference by thanking her and signing the card and encouraging her to send gifts too. We also celebrate the fact that the children enjoy doing different things with each parent. They are special mummy things (like going to a coffee shop) or daddy things (like going tree climbing). We stop them when they say “I prefer mummy because…” and we tell them that God gave them both of us as only then will they see all of God. It’s interesting to see that our children are becoming a beautiful unity of the different characteristics. For example our eldest daughter is incredibly creative like her mother and is taking art at A level. She is also very analytical like her father and is also taking maths at A level. The school is bewildered but we see it as the glory of God. But remember marriage is a shadow of the heavenly reality – our marriage to Christ (Eph 5:31-32). Realising that we need the other opens our eyes to the greater truth that we need Jesus: without Him we can do nothing (Jn 15:5). Without Him we are incomplete. Without Him we will never glorify God. 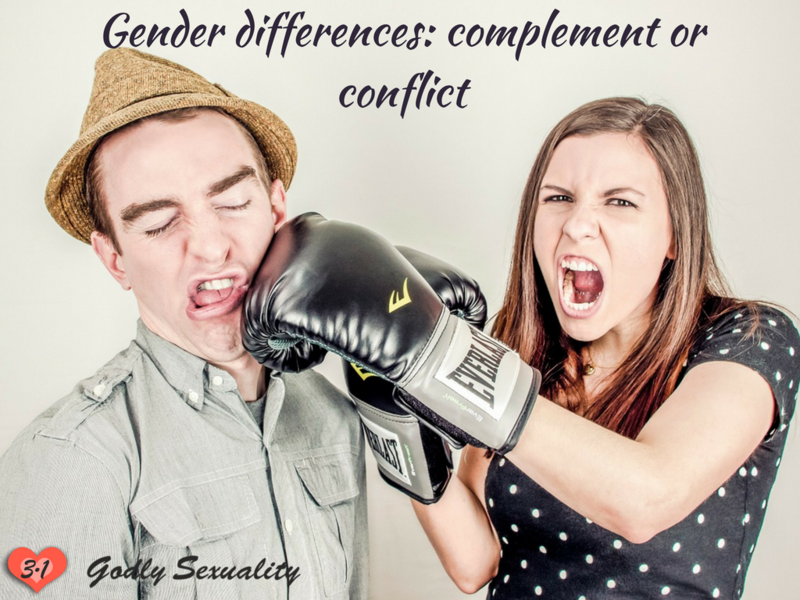 Father, forgive me that I have resented my spouse’s differences. Forgive me that I have tried to make them like me or got upset when they didn’t see what I saw. Help me to honour their differences as their gift to me and let me offer my complementarity as a gift to them. In Jesus’ name. Amen. *A note to single people. Don’t let anyone bash you over the head and say “You need to get married to experience the fullness of God”. The church community is the body of Christ and is made up of male and female and so you will experience this fullness when living and serving in the church community. †This is the same in a church. One person does not make a church. And Christ deliberately gives different gifts to the members of His Body so that all members are needed to build each other up. We only mature in community. Despite our worldly mentality that says there is one person in charge who does it all – this is simply not the case.